I woke up on the weekend determined to do an alcohol transfer mani. 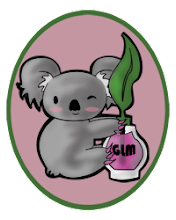 I'd had a half finished design in my head for months and somehow in my sleep I worked out how I wanted to finish it. I use laser prints and isopropyl alcohol for my transfers. I had my husband print off a sheet of designs a few months ago on his work colour laser printer (inkjet doesn't work) and they worked quite well. So I filed the printout away until I could work out the rest of my glorious design idea. Fast forward to this weekend and after many careful layers of light coloured polish for the background I went to do my transfers and... nothing! Not a single pixel of ink would transfer. The prints worked fine last time but now, after months sitting in my drawer, they won't transfer. I can only conclude that over time the laser ink somehow sets and I need fresh prints to get it to work. So I've filed that idea away for now. 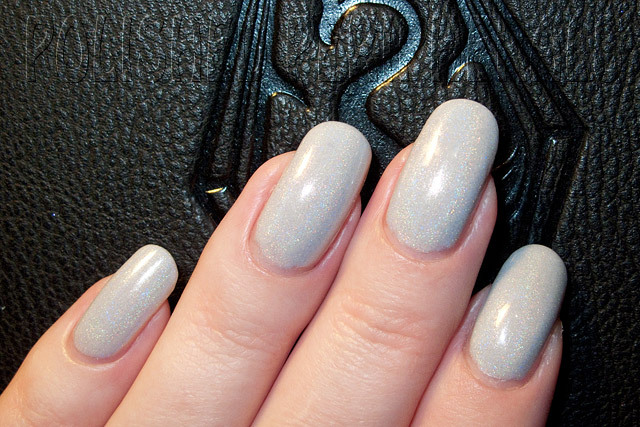 Glitter Gal Light as a Feather is a white holo that's really more of a pale grey colour. It has a very faint linear holo shimmer. This is 4! coats and was a nightmare to apply. With each coat I was tempted to give up but I was sure this colour would be the best base for my transfer design so I persisted. I don't know if I have a bad bottle or something, because I've read raving reviews of this polish being opaque in 2 coats and easy to apply, but for me it was streaky, grabby and bubbled like a spa. I used my usual Sally Hansen base coat and applied thin layers, waiting for each to dry completely before the next. I could have used thicker layers to get 2 coats but when I saw how the first layer bubbled I stuck to thin layers. Finally the top coat (Essie Good to Go) helped disguise the bubbles but that left me with 6 slow coats and I was pretty fed up. I told my husband I would never use this polish again. ...but, I really like this colour on me and the soft holo. I think it's very flattering on my (too) long nails and makes a nice 'palette cleanse' after a lot of bright colours. It really is light as a feather. It matches the dreary rainy days we've been having lately. For the price though (I have the tiny 9ml bottle) I expected more holo and more white, more impact over all. So it didn't live up to my expectations and was a pain to use but I keep coming back to liking the way it looks. Photographing holos is difficult, trying to catch the rainbows, but for this polish the camera actually shows more rainbows than I could see in life. After 2 days my Light as a Feather blank canvas was driving me crazy and I needed to add to it. I thought about all sorts of layers and nail art then decided to stamp. I'm a total stamping novice. I've done tests before but never a full mani of stamping. I struggle with designs big enough to cover my full nail and still have to find a technique to roll the design over the curve of my nails side to side and front to back. So I settled on this feather design that I could use somewhat randomly. I missed bits, smudged bits and I'm not sure I chose the best colour but I'm pretty pleased with this look for a first attempt. If I had more patience I'd paint on some little pink cherry blossoms but this is all coming off tonight. The edges of the Light as a Feather are starting to lift. The tips are fine, no chips but the back and sides are annoying me. I used Kleancolour Metallic Red for stamping with an image plate from You Mix Cosmetics which I can't actually see on their site anymore. If anyone wants to see the plate let me know and I'll snap a photo of it. 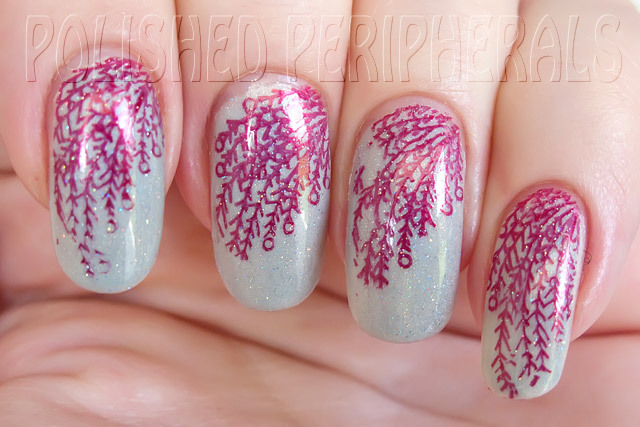 I think your stamping is perfect! That Glitter Gal is gorgeous! Love the Glitter Gal and I'm so impressed with your stamping! I still haven't managed to get the technique right yet. Thanks :) I think I need a lot more stamping practice. and thanks for the tag, I'll check it out tonight, after the birthday party.